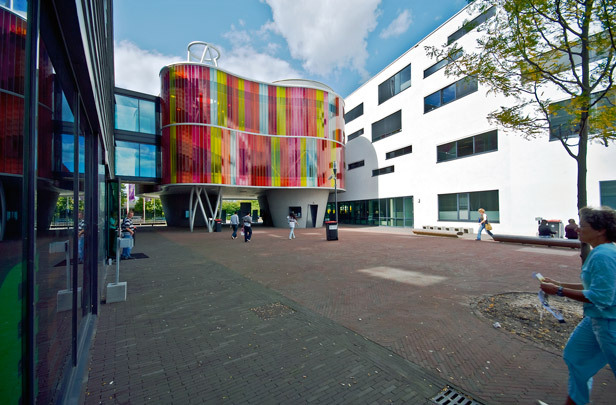 In the Leerpark education centre, schools for professional education combine with companies, some of them education-related, and housing. Two pre-vocational secondary schools by DKV (Insula College) and Hertzberger (Dalton Lyceum) are tied together by SeARCH's Combi Building of general facilities, technical subject rooms and a restaurant. Mecanoo's Da Vinci College is a senior vocational secondary school whose components assemble round a courtyard. An interior street on the second floor lashes it all together. The most remarkable component is a conference centre in a free-form glass volume. NL Architects designed the sports building and a music pavilion. Joep van Lieshout designed the bus stop.